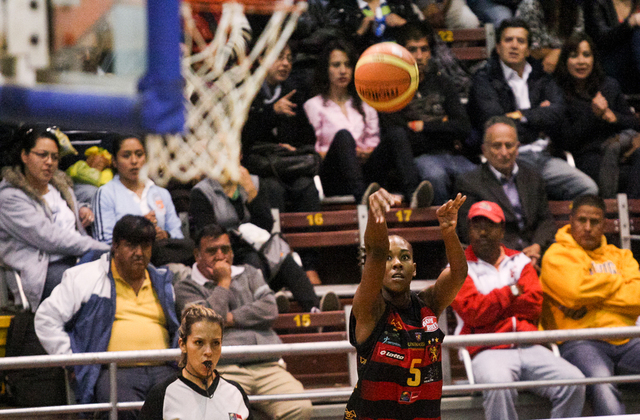 The team led by Gustavo Lima defeated Deportivo Berazategui, 81-69 and is the first to qualify to the final. Sandora Irvin was the scorer of the match with 21 points, plus 12 rebounds, the player was instrumental in the fourth quarter. Berazategui began with a fierce defense which allowed them to counterattack and get easy points from the hand of Sophia Castillo. The base was in good company with Andrea Boquete attack that brought 4 more points and the Argentine team went 8-0 in the first two minutes. Sport Club could iron out the difference from the hands of Taina Paixao and Adriana Pinto. With input from Boquete and Ornella Santana the team led by Juan Ferreira managed to keep up on the scoreboard. After a double from Sandora Irvin the directed by Gustavo Lima managed to tie the game at 16 with 2 minutes left. The final minute with Pinto twice in Brazilian could come to the front and end of the initial quarter winning 20-19 . A triple Pinto and one of Tatiane Nascimento at the start of the second quarter gave him seven points clear at Sport Club ( 26-19 ) and forces to ask Ferreira minute to order your team . After an offensive rebound obtained by Luciana Zinna her younger sister Noelia became the first triple of the Argentine team . Directed by Gustavo Lima took advantage of the drop in mood and basquetbolístico Argentine and escaped to 10 ( 32-22 ) with seven minutes to play. Berazategui depended purely and exclusively produced Boquete than playing in the low post or curtains that generated Castillo for his insights . A 5-0 run allowed them to deduct Argentine handicap and made 6 points ( 44-38 ) with just over 30 seconds on the electronic board . After each touchdown , the difference toward the long break was maintained. Pinto was the banner of Sport Club and who commanded the attack in the opening minutes of the third quarter . A triple Gattei Vanessa gave 9 points of advantage to Gustavo Lima, winning 53-44 in three minutes. A 6-0 Hand Boquete and Santana gave the possibility of becoming a Berazategui possession away ( 53-50 ) . The Ferreira continued to tighten in the first line and a double Celeste came forward Cabañez 54-53 , midway through the fourth . Again from 6.75 to Pinto and Gattei , Sport Club regained the lead on the scoreboard . With twice the Argentine Castillo entered the final quarter with minimal advantage ( 62-61 ) . had scored two points each, so the Argentinean team still in front by the minimum difference . Berazategui wrong roads and took hurried shots, which allowed him to Sport Club shows a small difference in their favor with the contribution of that advantage Irvin Santana was out for 5 fouls . A triple Paixao gave him 11 points of difference between Sport Club ( 78-67 ) jumper with less than two minutes in the electronic board , leaving virtually tilted the scales in your favor. Finally, the final score was 81-69 in favor of Brazil .